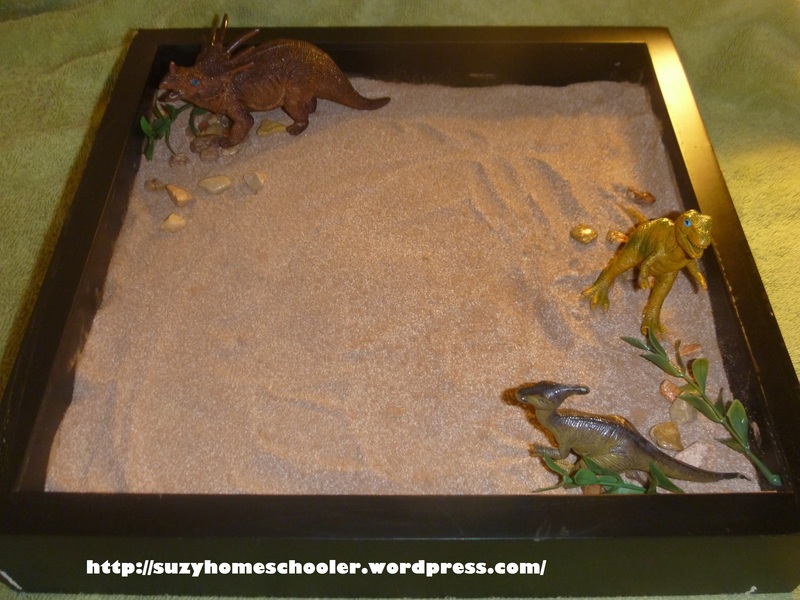 As I mentioned in my last post, I really wanted to capitalize on this dinosaur kick LittleMan is on and create a dinosaur themed sensory writing tray, much like the fairy and mermaid writing trays I had seen on Pinterest. Today, I finally found the motivation to put it together. LittleMan’s grandmother recently sent him a stack of dinosaur books she’d found hidden on her shelves so dinosaurs, which have always been popular in our home, are even bigger right now. 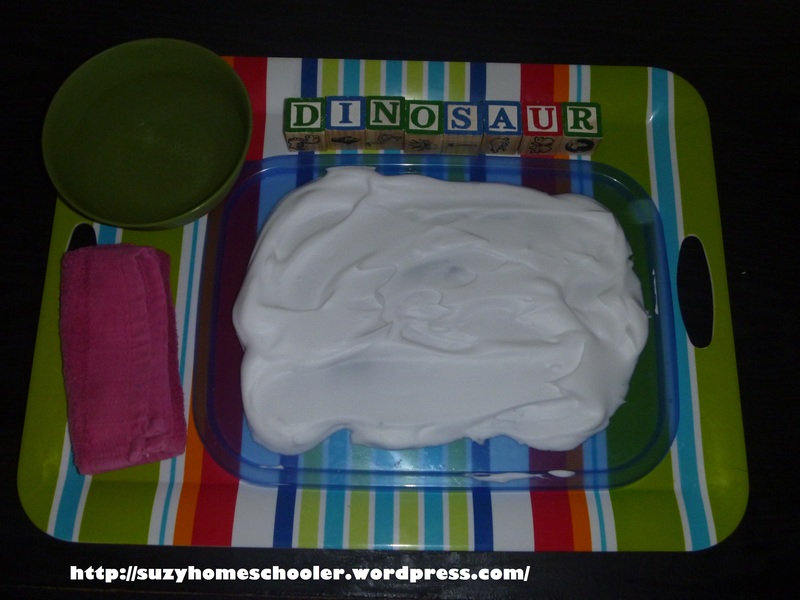 We read the books and set up various small world plays with our toy dinosaurs, use toy dinosaurs for painting dino tracks, last weekend we even froze some dinosaurs in a block of shaving cream to play with on a hot day. I wanted LittleMan do so some writing practice, something beyond tracing the words I write in highlighter on a piece of paper. 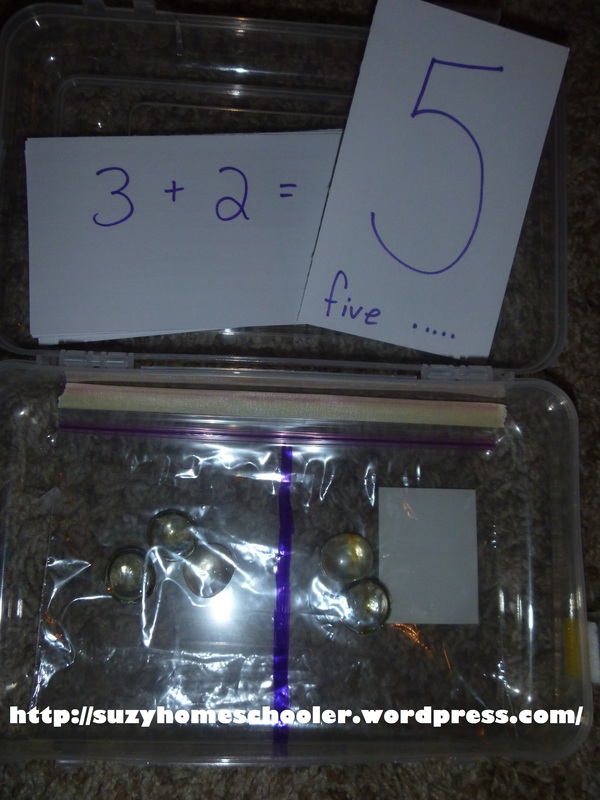 I had hoped to set up a whole theme writing tray like I had seen on Pinterest (like this, and this). I still plan on putting one together, but to be frank, I just didn’t have the time or motivation do to so. We took the plunge and started LittleMan on his first early readers. 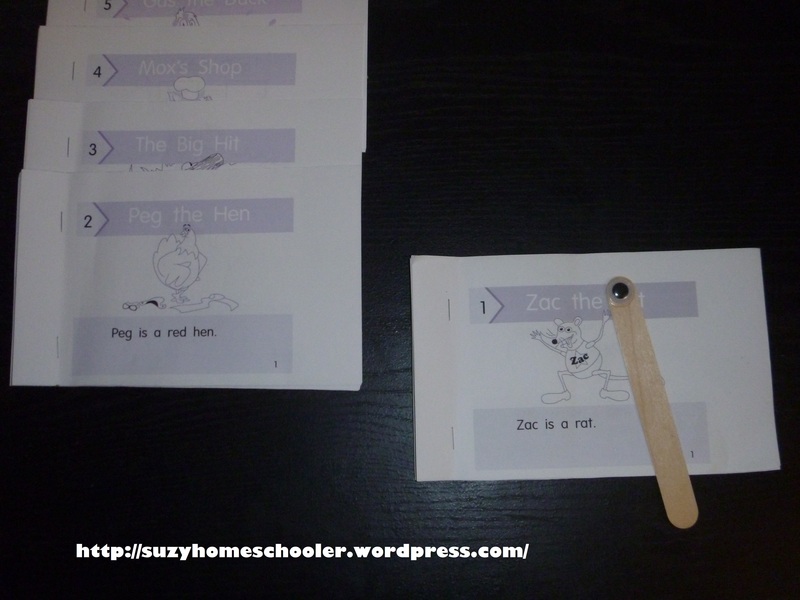 He’d been playing around with our Dr Seuss collection and working on small individual words. It felt like the next natural step. Right now he’s mostly still mirroring us, learning how to sound out words. At first I thought it was because an item was associated with that superhero, or because he recognized the font that the name was written in. Then I wrote them down in my own handwriting and without saying a word showed the paper to him. He recognized the words and immediately read them off to me. Guess all those comic books we’ve been reading together are finally paying off. I used to do “letter of the week” style drills with LittleMan. I would direct his attention to that letter, read him stories about that letter, have him trace that letter, talk about objects which names started with that letter, etc.. But I found that it didn’t work. Last week our family did our first grocery trip of our no spend month and we had all agreed that we would only buy what was on the list, so I made sure to put a couple small treats that we don’t normally get on the list. The first of those treats was a box of generic Fruit Loops. We had a ton of fun answering that question! When we lived in the UK, LittleMan got hooked on a popular British book series known as the Mr Men books. There’s Mr Happy, Mr Greedy, Mr Bump, Mr Bounce, Mr Tall, Mr Small and a whole slew of other Mr’s. 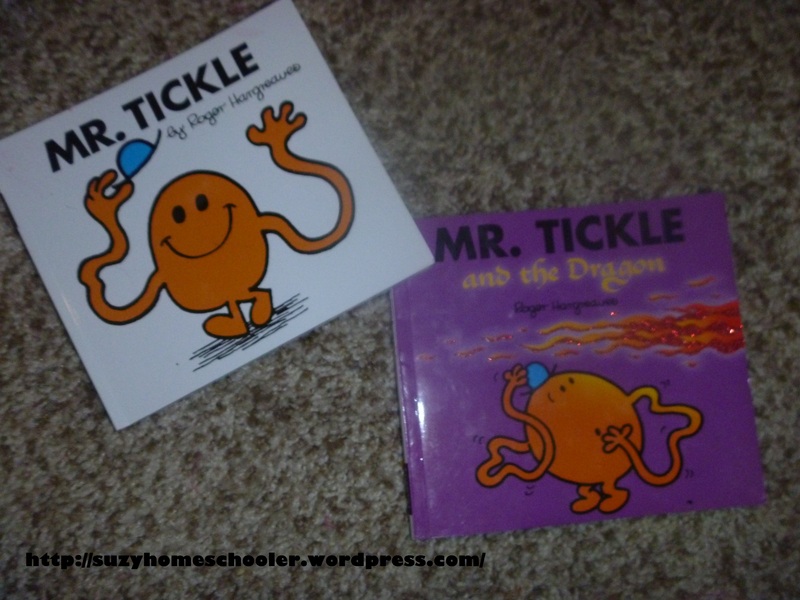 LittleMan’s personal favorite is Mr Tickle. Today I was planning to do a color themed bath for the kids. Simple, easy, fun. Just throw in some balls and balloons, maybe some legos all the same color. Add scented bath paint and colored water and you’re golden. But sometime around breakfast I went from deciding to do a blue themed bath, to doing a purple themed bath, to doing a Harold and the Purple Crayon themed bath. 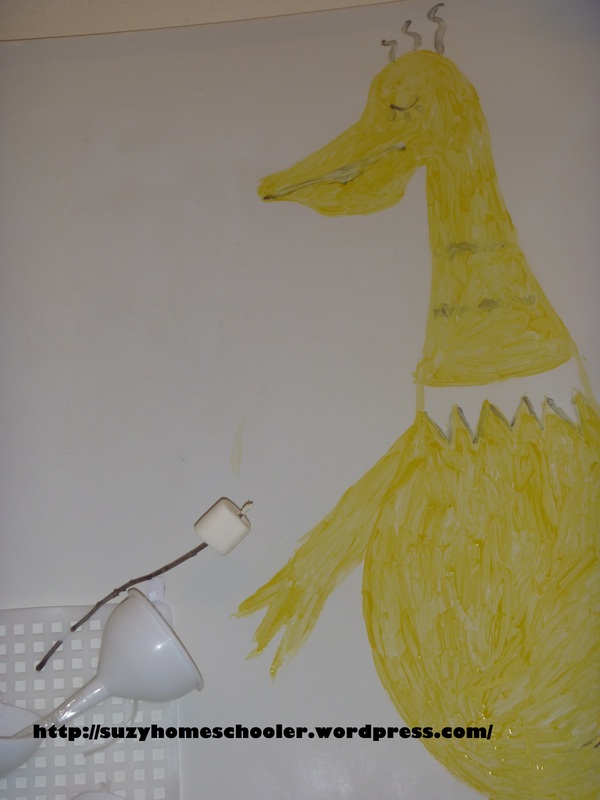 Once my mind got onto Harold and the Purple Crayon things just started happening. Next thing I know I had thrown together an entire Harold and the Purple Crayon themed day for the kids. 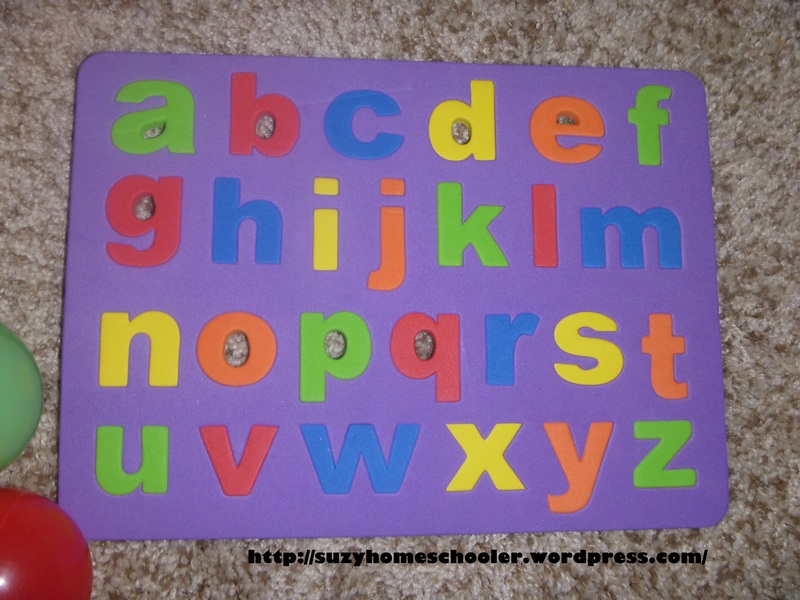 Last week I saw this alphabet puzzle at Staples for $1 and it reminded me of an activity that I saw several months ago on Little Hands, Big Work.